Recent increasing awareness of the ways in which vibrational effects can affect low-gravity experiments have renewed interest in the study of thermal vibrational convection across a wide range of fields. For example, in applications where vibrational effects are used to provide active control of heat and mass transfer, such as in heat exchangers, stirrers, mineral separators and crystal growth, a sound understanding of the fundamental theory is required. In Thermal Vibrational Convection, the authors present the theory of vibrational effects caused by a static gravity field, and of fluid flows which appear under vibration in fluid-filled cavities. The first part of the book discusses fluid-filled cavities where the fluid motion only appears in the presence of temperature non-uniformities, while the second considers those situations where the vibrational effects are caused by a non-uniform field. Throughout, the authors concentrate on consideration of high frequency vibrations, where averaging methods can be successfully applied in the study of the phenomena. Written by two of the pioneers in this field, Thermal Vibrational Convection will be of great interest to scientists and engineers working in the many areas that are concerned with vibration, and its effect on heat and mass transfer. These include hydrodynamics, hydro-mechanics, low gravity physics and mechanics, and geophysics. The rigorous approach adopted in presenting the theory of this fascinating and highly topical area will facilitate a greater understanding of the phenomena involved, and will lead to the development of more and better-designed experiments. 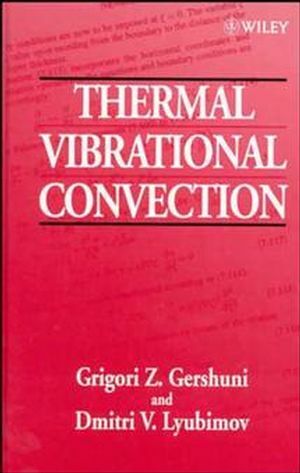 G. Z. Gershuni is the author of Thermal Vibrational Convection, published by Wiley. ALEXANDER V. LYUBIMOV, MD, PhD, DABT, is Director of the Toxicology Research Laboratory and Associate Professor of Pharmacology at the University of Illinois at Chicago. He has more than thirty years of experience in the fields of toxicology, bioanalytical chemistry, and drug efficacy. Basic Equations: Mechanical "Quasi-equilibrium" and ItsStability. Plane-Parallel Flows and Their Stability. Thermovibrational Convection in the General Case of ArbitraryVibrations. The Problem of Boundary Conditions.